I don't have any particular fondness for '80s movies - I've only ever seen Gremlins once, E.T. once or twice, Goonies never, etc. - so the manufactured nostalgia of Stranger Things doesn't really draw me in. But I'm a sucker for a nice monster design, so here we go with this thing. 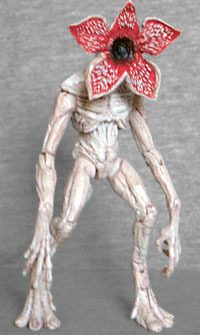 This happy fellow is the Demogorgon, which all the merchandising leads me to believe is the major threat of Stranger Things Season 1. Is there only one of them, like in Alien, or are there tons of them, like in Aliens? I don't know! I know it probably comes from uʍop ǝpısdn ǝɥʇ because some things you just pick up through pop cultural osmosis alone. Maybe this is what happens when you feed that little Eggo girl after midnight. Is the little Eggo girl Barb? Because people were all upset about Barb. If you feed Barb Eggos after midnight, she turns into a Demogorgon. NOW THAT I HAVE SAID IT, IT MUST BE CANON! Though the name "Demogorgon" can ultimately be traced back to a clerical error sometime before the tenth century, it managed to capture the imagination of Middle Ages Europe like a Biblical Boba Fett. Whole backstories were created to explain a random typo, to the point where everybody "knew" the Demogorgon was a primal Greek diety and it was adopted as a devil by Christianity. Anyway, that pedigree led to the Demogorgon (or its name, at least) being used as a D&D monster by Gary Gygax. The D&D monster has been depicted by various minis over the years, and one of those minis was used to represent the concept of "monster" on the show, which is why the unnamed terror is called that in the merch. The show's monster was described as a humanoid creature with no face, just a mouth, and that's definitely what the creators delivered. 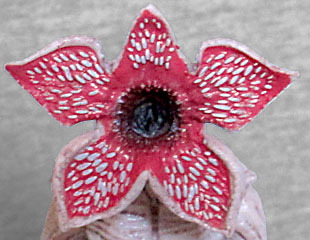 Demogorgon's defining feature is its head, which opens like a pentaphyllon flower (that means it has five petals), the inside of which is lined with sharp teeth all pointed toward a single, gaping hole in the center. The creature's body is mostly shaped like a human (whenever possible, it was played by a guy in a suit), but its anatomy is drawn out and distended, with long limbs, huge digitigrade feet, stretched-out hands and fingers, and a ribcage that's nearly visible through its skin. The musculature is long and ropy, and the skin somehow manages to look both tight and droopy at the same time. This is clearly not human, or even anything that was once human, but it's not entirely alien to us, either. 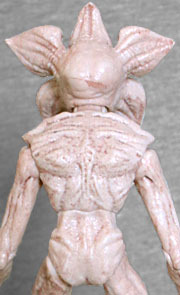 The Demogorgon is pale pink with a darker wash to bring out the details of the sculpt. The interior of its facemouth is a more vibrant pink (not quite reaching all the way to red), fading to black as you near its gullet, and the teeth are all picked out cleanly in white. There was only one Demogorgon at the store (Target, in case you were wondering), so there was no comparing paint apps to see if one was better than the others. With nothing to contrast it against, this random sample is good enough. The fact that it doesn't have any eyes probably helps - a little mistake in applying the eye paint can turn an "okay" figure into a total derp fest. Thankfully, the articulation is good, too. Many people have reported problems with loose ankles on their figures, but mine is hunky-dory. This figure is part of Funko's "9POA" line, the thing they created when they let the rights to "ReAction" go back to Super7; but rather than having nine points of articulation, Pinkie Pie here gets 13: balljointed head, swivel/hinge shoulders, hinged elbows, hinged wrists, balljointed hips, hinged knees, and hinged ankles. The upper and lower body are separate pieces, but they're glued together, not joined by any sort of torso or waist joint. Still, the ankles on mine are good, so I'm just glad he's capable of standing up. The packaging is as much of a throwback as everything else about this property. It's a blister card with the TV series' poster art on a black background, and the figure is just loose inside the bubble - no plastic tray to hold it perfectly in place. The back of the card has some pretty crummy graphic design, showing off the six figures available in this series, and handing over a big chunk of real estate to warning labels in 10 different languages. It's nice enough overall, but it's not something you need to worry about saving at all. Appreciate it momentarily, then rip it open and throw it in the recycling. 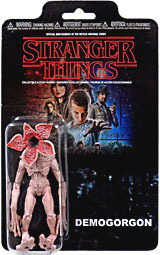 It's good that in addition to the three-packs Rustin found, Funko is selling these Stranger Things figures solo-carded as well: I may not care at all about the show, but Doctor Mindbender and Serpentor can always use some more generic monsters to send after the GI Joe team, Dr. Stange can use some demons to fight, and Luke Skywalker can worry about scary aliens. 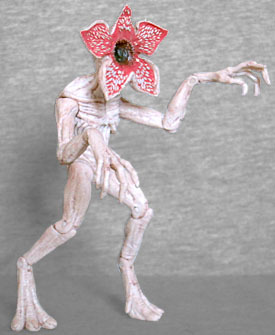 There are lots of reasons to want a Demogorgon, and you don't have to buy two random kids to get it.